The patient losses physical balance and body movement co-ordination. Numbness occur due to ruptured vessels because the impulses are not transferred. Tingling, paralysis of face region named facial paralysis, the patient may have blurry vision or multiple images are seen. The eyelids of patient start drooping along with headache, nausea and vomiting sometimes the patient get faint. Patient also face problems in speaking, swallowing food, writing activity and reading a book because vision is also affected in thalamic stroke. Some symptoms depend upon the depth and location of injury. 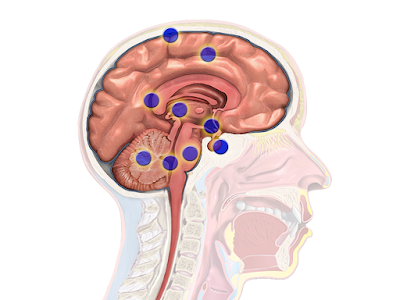 The thalamic stroke may be at right or left side of thalamus. The thalamic stroke occurring at the left side of thalamus may cause different problems to the opposite side of thalamus affected. Left sided thalamic stroke or hemorrhage affect the writing capability. Agraphia (problem in oral language speaking along with writing problems), aphasia, agnosia and other sensory deficits can occur as a result of left thalamic lesion. The main senses disturbed with left thalamic stroke are speaking, talking to anyone, slow speech, problems in hearing could be moderate to mild and par aphasia. Problem in comprehension reading is also faced by the patient with left thalamic stroke. Whenever there is right sided thalamic stroke damaged or affected, problems occur to the opposite body side i.e. left side. As in case of facial paralysis the left side of face is affected if the right sided thalamus stroke occur. Patient feel pain in limbs (arms and legs) and the senses are also affected i.e. eating, writing, walking, hearing and vision. Side of the brain having thalamic stroke show tingling but when it is touched, it feels normal. Parts of the body opposite to the thalamic stroke shows as in paralytic situation. The treatment is totally dependent upon the cause and severity of bleeding occur due to rupturing. Along with stroke treatment the blood pressure, intracranial pressure, seizures and bleeding is also controlled via medications. Anticonvulsants are used to treat seizures. To control blood pressure and risk factors of heart diseases anti-hypertensive drugs are used. Osmotic diuretics are used to minimize the intracranial pressure. Glucose levels should also be managed along with medications. Mannitol is used to treat intracranial pressure. Evacuation of hematoma via endoscopy or open craniotomy is used as surgical intervention. Anti-thrombotic agents are used to treat thrombosis. Prognosis mainly depends upon severity of stroke, overall condition of patient and prompt intervention. If further complications may also involved then it becomes hard to restore the normal state. Proper diagnosis and early intervention play key role in prognosis and survival of patient.